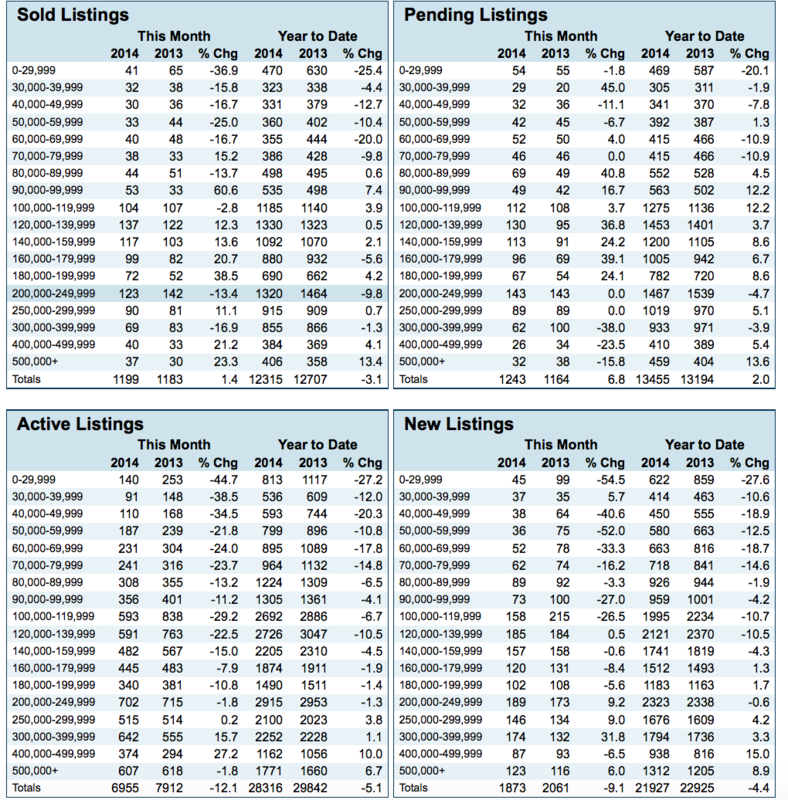 New Louisville Home Sales Numbers - Encouraging! Buyers are starting to climb off the fence and get back to finding a home after a minor slump in Louisville home sales the last few months. The latest home sales numbers from the Greater Louisville Association of Realtors shows The number of homes going under contract up 6.8% and homes sold (closed) up 1.4% last month compared to October 2013. Interest rates hovering around 4% and speculation that those rates may increase in 2015 may be at the heart of the renewed interest in buying homes. Those numbers may have been even better of buyers had more of an inventory to choose from. The number of active listings was actually down 12.1% and the number of new homes coming onto the market last month was down 9.1% when compared to October 2013. Because there are fewer (less expensive) foreclosure and short sale homes on the market the average home sale price was up 9.04% (from $226,885 to $247,339) over a year ago. Additionally the average days on market were down from 93 to 87 days. All positive news and there’s one more important piece of the puzzle. The absorption rate was down 10.99% (from 6.46% to 5.75%.) from October 2013. Why is the Absorption Rate important? The Absorption rate looks at the number of home sales and inventory. So for example if market conditions remain the same and no new listings come on the market it would take buyers 5.75 months to purchase all current homes the market. A balanced market’s absorption rate is typically between 5 – 7 months. The 5.75% absorption rate puts Louisville closer to a sellers market than a year ago. For buyers, that’s a concern because with fewer homes on the market and more buyers looking, prices can and will go up as days on the market go down. For buyers, now is the time to find a home especially with the current low interest rates. For sellers, now is the time to consider listing the home, We can help. Call (502) 376 5483. One other item, check out our Louisville Real Estate Radio show on 840 WHAS. Sunday morning from 8:30am -9:00am. * Please note The Greater Louisville Association of Realtors does not enforce a cutoff date for the end of the month numbers. As a result the numbers contained within this report were taken from GLAR statistics November 2, 2014. The numbers may improve over the next week or weeks.